Dear Mr Pop Star is such a fun book to read! Derek Philpott and his son Dave took to writing tongue in cheek letters to pop stars taking them to take them to task over some of their lyrics or indeed the band name. (Doctor and the Medics – surely a doctor is a medic?) As you might expect, some were ignored but surprisingly, some of the recipients wrote back! This book is a collection of the letters and replies. I loved in particular the letters to bands I was a fan of in the 1980s. As I’m sure most of you know, the lyrics from songs you loved in your teenage years stick in the mind and you never really forget them. A song can come on that you’ve never heard for years and you can still happily sing along. So the letter to Spandau Ballet suggesting they were ripped off buying ‘a ticket to the world’ made me laugh. Sadly it was one which doesn’t seem to have received a reply. I also enjoyed a letter sent to both Eddy Grant and the Scissor Sisters simply saying “Well don’t then!” The response from Henry Priestman to the letter about The Christian’s Hooverville is sheer class, full of vacuum cleaning puns! The reply from EMF is also a cracker. As a huge Billy Joel fan, I also enjoyed the letter to him which took me a moment to figure out what song it was referring to (Tell Her About It). I was sorry to see it didn’t get a response. And you must watch out for the letter to The Waitresses about their hit Christmas Wrapping and the subsequent reply – absolutely brilliant! It was great to see that many of the popstars clearly have a great sense of humour and got on board with the joke in their replies. 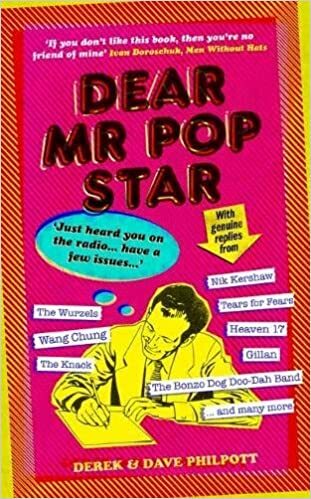 Dear Mr Pop Star is such an entertaining book to dip in and out of. It would make a great gift for any music lover.